If you look at the way text is presented in many books / newspapers / magazines / web sites / etc., you'll see that they often go out of their way to emphasize the first letter. This is nothing new, though. If a screenshot doesn't satisfy you, you can see a live version of this example instead. Let's get started! Let's fix that. In the following sections, you'll learn several ways on how you can rectify that stylistic omission in ways that will make Aristotle proud. The most straightforward way to style a character in a word is to wrap that character inside a span tag, give that tag a class value, and write some CSS to target that class. As shown above, give your span tag a class value of firstLetter as well. 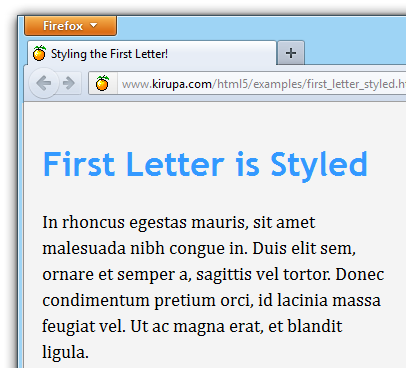 Once you have made this change to your HTML, all you need to do is add a CSS rule whose selector targets firstLetter. This is just one way of styling the first letter. As you will see in a future section, there are ways to emulate this behavior by using just CSS and pseudo-selectors. In the subsequent sections, we'll be looking at the effect of various CSS selectors on our document, but the style declarations themselves we will be using will be identical. Most of the style declarations are pretty straightforward. The one thing that may not be obvious is the float property and its left value. By setting the float property to left, we ensure that the remaining text wraps around our character. After that, setting the margin-right and margin-top properties helps pad our character appropriately from the content around it. No, I am not making this up! 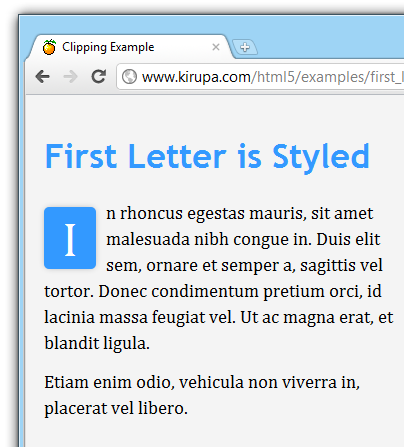 There is a pseudo selector in CSS called first-letter. 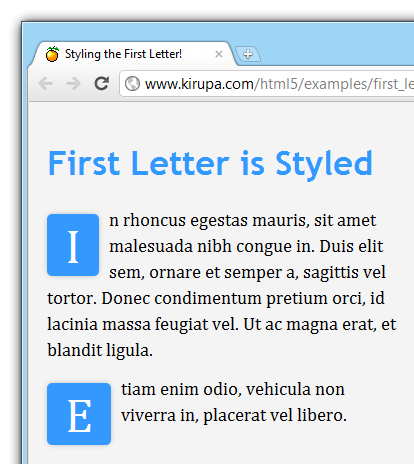 As you can guess, this selector applies styles to the first letter it encounters. Notice the first letter from each of our p tags now has our unique and awesome style applied to it. The universal p selector applies to every p tag in our document. The first-letter pseudo selector modifies our p tag selector by selecting only the first letter. That is why the first letter from both of our p tags has our style applied to it. Now, you may only want to apply your style to only one first letter as opposed to every first letter in every paragraph. In the next section, let's look at how to do that. If you want to apply your style to only the first instance of the first letter, using just the first-letter pseudo selector will not work. You need to augment your selector by using the first-of-type pseudo selector as well. What the first-of-type pseudo selector does is ensure that you only select the first occurrence of your p tag. If your document has two p tags, such as our example, only the first p tag will be selected. With our first p tag selected, using the first-letter pseudo selector simply applies the style to the first letter. Notice that our first paragraph has the first letter stand out. Our second paragraph's first letter is normal with no additional styling applied. Well, that's all there is to learning about how to style the first letter. The span approach I described initially will work well, but I am biased towards the cleaner approach using the first-letter and first-of-type pseudo selectors. With CSS, you have a lot of flexibility in styling your text. In this tutorial, I didn't touch upon a lot of other interesting variations you can do with text formatting or even what you can do with just the first letter. Fortunately, you can see some really practical and cool examples with their associated markup on Jon Tan's 12 Examples of Paragraph Typography article.